Common English Names: Brown Stingray, Roughtail stingray, Roughtail ray, Rough-tailed stingray. Identification: An enormous stingray. Rhomboid disc with rounded pectoral tips and straight leading edges. Tip of snout protruding. Thorns scattered on midline of back and prominent thorns along midline and sides of tail. Tail approx twice disc width with long, low ventral finfold. Dorsum grey/brown to olive brown, sometimes blackish. Ventrum pale. Size: Maximum disc width 260cm. Usually 100 to 130cm. At birth 35cm. Habitat: Sand and mud bottoms from intertidal to 800m. Inhabits coastal areas, estuaries, and rivers. Distribution: Western Atlantic - Georges Bank to Florida, Gulf of Mexico, and Uruguay to Southern Brazil. Subtropical; 45°N - 35°S, 90°W - 36°E. Diet: Preys on crabs, prawns and small bony fishes. Conservation Status: The IUCN lists the Brown Stingray Bathytoshia lata as LEAST CONCERN. However, the assessment is out of date and still refers to populations on both sides of the Atlantic. Consequently, the following information should not be relied upon to determine policy. In the Mediterranean this stingray is taken as bycatch of the artisanal fisheries, bottom set longline, gillnet and handline (Fischer et al. 1987). Benthic trawl effort has increased both effort and efficiency in the shelf and slope areas of the Mediterranean Sea over the last 50 years. The continental shelf and upper slope of the Mediterranean Sea are highly exploited, with intensive commercial trawling occurring at depths ranging from 50 to 700-800 m (Colloca et al. 2003, Massuti and Moranta 2003). As a result there has been increasing concern about changes in the abundance and diversity of elasmobranchs in this region, and decreases in the abundance and biomass of some species throughout the last decade have been reported in highly exploited areas such as the Gulf of Lions (Aldebert 1997, Massuti and Moranta 2003). Although no species specific data are available, the very large size of D. centroura makes it intrinsically vulnerable to population depletion. Given that this species is rarely captured in the Mediterranean, high exploitation of the continental shelf, its intrinsic vulnerability and evidence for declines where data are available in other elasmobranch species within this region, it is suspected to have declined. Photographs: Los Gigantes, Tenerife, Canary Islands, North West Africa. 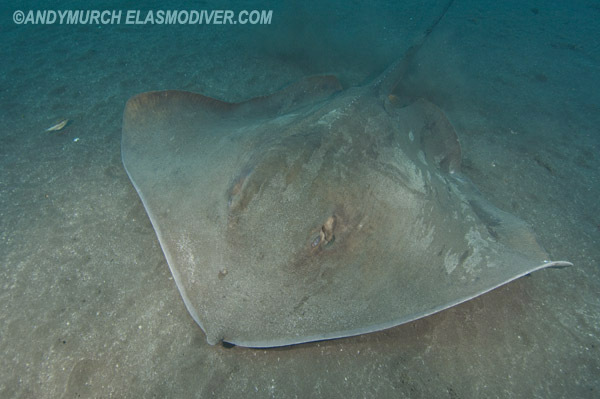 Similar species: In the western Atlantic, there is a closely related Roughtail Stingray - Bathytoshia centroura. This ray was recently split from Bathytoshia lata but further analysis may recombine these species. Reaction to divers: May be approached with non threatening movements. Diving logistics: Los Gigantes on Tenerife is the place to encounter this species. 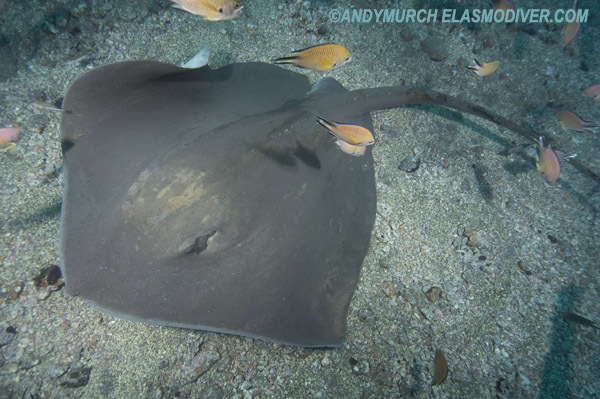 Los Gigantes Dive Centre runs feeds twice weekly that attract up to six species of rays usually including this one. Ebert, D.A., Vidthayanon, D.A. & Samiengo, B. 2016. Bathytoshia lata. The IUCN Red List of Threatened Species 2016: e.T161386A104066775. http://dx.doi.org/10.2305/IUCN.UK.2016-3.RLTS.T161386A104066775.en. Downloaded on 23 October 2017.